Alas dear readers I am about to bestow upon you one manly drink. This is not for the faint of tasters. It is a drink that is for those who can picture what it is like to eat a leather belt because you are lost in the forest with nothing else to eat. 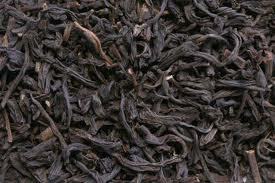 Take one cup of hot Lapsang Souchong tea, brewed strong. Take one teaspoon of honey. Mix together and serve in a chipped mug.